The Arsenal 2005 13U Girls Blue team coached by Sean Lawlor and Jamul Hahn, captured the U13/14 girls’ championship at the Montana Rush Cup the weekend of May 12th for back-to-back tournament titles. En route to the title game, they defeated MT Rush 2005 (5-1) and Flathead Force 2005 (4-3) and earned a tie with MT Rush 2004 (0-0) in bracket play. 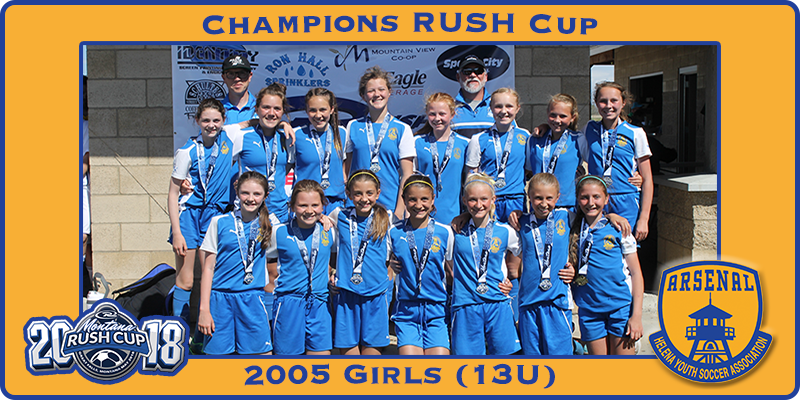 Displaying a dominant team effort, they defeated MT Rush 2004 (5-0) in the championship game, avenging the earlier draw. Providing scoring for Helena throughout the tournament (9-3-1 overall, 3-1 in conference) were Avery Kraft (5 goals, assist), Tess Lawlor (4 goals, 3 assists), Logan Todorovich (2 goals, assist), Madi Todorovich (goal, 3 assists), Natell Goodman (goal), Molli Soper (2 assists), and Astri Hahn (assist). Solid goal keeping was shared by Maddie Burda and Morgan Kaufman. A formidable defensive effort was led by Sydney Emmons, Celi Chapman, and Brooklyn Brisko, with strong midfield play from Josie Esponda, Lauren Hoxie and Morgan Hayes with Kaidyn Dolezal assisting the forward line.